I Thomas Lincoln no rainy. Ny vadiny dia Mary Todd Lincoln. Ny zanany dia Robert Todd Lincoln, Edward Baker Lincoln, William Wallace Lincoln, Tad Lincoln. 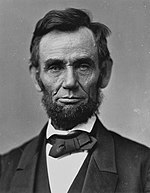 Ny rahalahiny sy/na ny rahavaviny dia Sarah Lincoln Grigsby, Thomas Lincoln, Jr..
Voaova farany tamin'ny 31 Janoary 2018 amin'ny 17:58 ity pejy ity.